How Did The Civil War in Nicaragua Exile My Mother Mercedes From Her Own Country, and How Did This Force Her To Find A New Home? My mother, Mercedes Mendoza (which is not her full name, as she wishes that her full name remain anonymous), was born in Managua, Nicaragua in the year 1951. From the time she was young, she knew only war, because in Nicaragua she survived two wars, and an earthquake that according to my mom “leveled” Nicaragua, which means that most if not all buildings fell. She fled Nicaragua with her oldest six children in June of the year 1982. She fled after the FSLN (the Sandinista front) entered the city in 1979, because it was rumored that things would get worse, and they did after the Sandinista movement took over. She fled to United States, because this is the closest country that she could travel to where she had friends that were willing to help her and her six children escape the wars in Nicaragua. “We could say that we did not invent the fundamental elements of our liberation ourselves. The vanguard gathered the ideas from Sandino, from our own people, and this is what enabled us to lead the people toward their liberty. We found political, military, ideological, and moral elements in our own people, in our own history” (23). The Sandinista movement was not really established until 1961, 30 years after Augusto Sandino’s time, but the people of Nicaragua found a name to follow, a hero, a man who had had the same ideals that they had, and just like it states in the quote above, they found those same moral elements in their own history. Although the now called Sandinistas were fighting for the people against the dictator Somoza, they, along with the Somosistas, made a lot of choices that affected the people. They would force children to fight; they would take full classrooms at times, and take them to the jungles to fight. These actions in a way made them no different than the dictators who were also killing innocent people. Just like the quote states, this was one of the events that enraged people, and got them to want a change. This was, like the saying, the one of the events that caused the cup to overflow, because the people of Nicaragua had had enough. Kids that she had carried and had babysat were dying, so what was to say that her kids where not next? Both sides of the war they were killing innocent lives one way or another, and no matter what party she looked at, whether it was the Sandinistas or the Guardia, they were killing people directly or indirectly. She also later told me that she was not interested in joining either party because she just wanted to live her life and raise her kids in peace, but as she soon saw, that was not going to happen. The Sandinistas were pushing her away, because they were forcing her to do something for the cause that should not be forced but she should want to do if they where really working for the people. The guard had placed the curfew at 6pm, and anyone seen outside after 6 would be killed. According to my mother, the Guardia would not threaten in vain, so these people must have been desperate enough to risk being killed on site for violating curfew, than to be burned to death. Here we can see that they started with kids by brainwashing them like my mother states, into following the Sandinista movement. My mom also recalls a time when my oldest brother came from school and asked her sign a permission slip for him to join a group of Niños Sandinistas, which translates to Sandinista Children. She said that she would not sign, and that’s when my oldest brother said that if she didn’t sign, then his teacher would. My mom was obviously outraged, and saw then the route that the Sandinistas were moving in, and saw them in a way similar to the Somoza dictatorship. These women had to carry white flags just to walk around their own neighborhoods, and were afraid that at any moment another air raid would come. There was no sense of peace, and they had to live under that constant stress that war brings. This was no place or environment to raise kids in. Ten days before the war was over four guards where guarding our house…because in previous days guerilla fighters had entered our home during combat, so they where saying that they where going to find that house… and kill everyone. Like it was their fault. Without them knowing they where in the right place, because it was our house that the guerillas had entered in during combat. My mom saw danger on both sides of the war, and had no place to turn to. Both the Sandinistas and the Guardia where threatening, forcing, and killing people, and she saw herself and her family as a target on both sides. There was no one else to turn to because those were the only two parties that had power, and they both had that mentality that “you are either for us or against us.” The Guardia was bombing neighborhoods and killing innocent families, along with kids that had no fault in the war, and the Sandinistas were kidnapping and forcing kids to fight in their war. They would in some occasions take whole classrooms give the kids guns and tell them to go fight. That is my mom decided that she had to do something, because her oldest son was around the age, even a little older that some of the kids that had been taken by force to fight, and if the counter-revolution was on its way then she had to get all of her kids out of the country right away. That’s why I decided to come to this country, because if not, I tell you, more than one of my kids would have died, or would have been mutilated, because I know of people that were mutilated…that was the reason why I decide to come… to save my kids. Practically, it was because of the war, because I would say no, I have my house over there I have my things and my family…it was hard to technically start over again. Here we could see that only drastic measures would have caused her to uproot and move to another place. She had a home, with all of her belongings, and her family in Nicaragua a country that no matter what she loved and continues to love, but her kids where in danger and she had to act quickly if she wanted to save her kids, because she was running out of time. Running out of time, because her oldest kids where already at age to fight in the war, there was no food to eat, and the next war was about to begin if it hadn’t already. Some people say that to escape from a war in their country, there is no need to go all the way to the United States that they could easily could go to a neighboring country and seek asylum. This of course is very true, but what people don’t see, is that during the 1980’s, when my mom left Nicaragua, the other neighboring countries where also having civil wars of their own. To add on to that, many people say that Nicaraguenses hate the United States for what they have done to their country, and this of course is also true to some extent. Not all Nicaraguenses hate the United States. My mom, for example, does not blame the United States for the war and everything that has happened to Nicaragua; she blames the people, and she states that a person should not point fingers at someone else and blame someone else for their own mistakes. Yes the United States did have some major parts in the war, but at the end the people that committed the atrocities where the Nicaraguenses themselves, because all the U.S. really did, was supply. The civil war gave my mom no choice but to flee from her country and find a new home because her life and the life of her kids was being threatened from both sides of the civil war. The Sandinistas were forcing her and her family to participate in their activities or else there would be consequences if she did not, and the Guardia with their brutal tactics, were threatening to kill them indirectly, because every time that there was a bombing her and her kids lives would be in danger. When her home was no longer safe to live in, she was forced to leave and find a home that was safer to live in, and a good place to raise her kids free from the dangers of war. She chose the United States because it was the closest country that was safe enough, and where she had friends that where willing to help her get their and start a new life. Aguiar Mejia-Mendoza, Luisa Amanda de las Mercedes. Interview in Spanish. March 29th, 2013. Interviewer and Translator, Mendoza, Judith. Vandem, Harry E. and Prevost Gary. Democracy and Socialism in Sandinista Nicaragua. Lynne Rienner Publishers, 1996. Quote by, Humberto Ortega Saavedra. Smagula, Stefan. Nicaraguan Americans. Countries and their Cultures. Website: Everyculture. Lernoux, Penny. 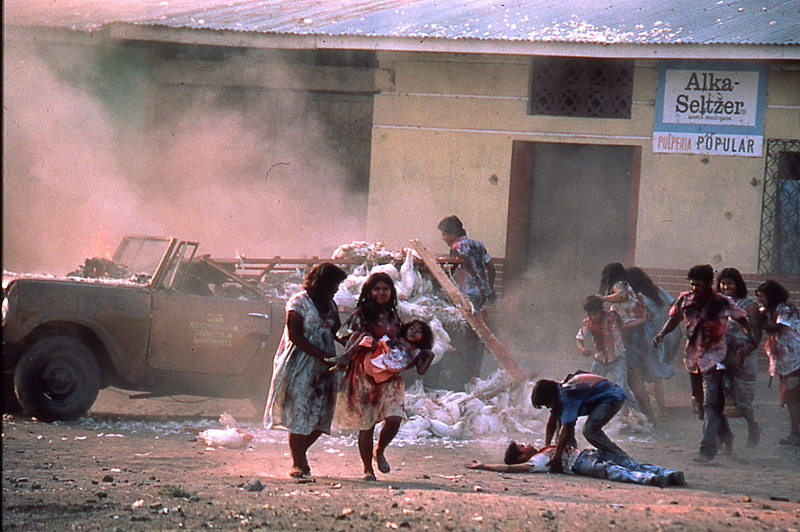 “Nicaragua’s Civil War. Showdown With The Somozas.” The Nation. September 16th, 1978. Copyright Nation Company Inc.
Porque dejo Nicaragua y se vino a los Estados Unidos? Bueno, más que todo fue una decisión bastante dura bastante difícil, porque yo amo mucho a mi familia y mi familia esta allá pero me vine por, más que todo por la Guerra. He vivido varias guerras halla, y la ultima fue bastante cruel bastante sanguinaria, sufrí bastante. Esta Guerra fue entre la guardia que son con los somosas y los guerrilleros que ahora son los actuales sandinistas. Que clase de cosas sucedieron durante la Guerra que hizo que se disidiera venir? Bueno, sucedieron muchísimas, porque yo recuerdo que cuando tomaron los barrios un nueve de septiembre, un ano antes yo estaba embarazada. Tenia siete meses de embarazo y fue duro fue terrible porque sin aviso ni nada bueno aquella balacera que hubo y tuve que dormir tuvimos que dormir todos en el piso y de eso me causo bastante, bastante daño porque no me podía ni sentar ni parar ni nada porque me sentía bien mal. Y apenas bueno estaba bien bastante joven tenia 27 anos tenia. También bueno después de ya la Guerra, aquellos enfrentamientos que sin previo aviso sin nada comenzaban, y le silbaban a uno las balas tenia que inmediatamente tirarse al piso habían noches que eran horribles, no había luz, no teníamos agua, bueno fue algo espantoso y después que cuando ellos ganaron, ganaron los sandinistas, ahora los sandinistas ellos racionaron la comida ósea el racionado quiere decir que teníamos apenas una libra para cada uno. Fue un momento difícil porque también me exigían que hiciera vigilancia, la vigilancia consistía en que tenia que estar afuera, pasar toda la noche con un silbato y si miraba alguna cosa que tocara ese silbato pero yo soy mujer y pasar toda la noche mis muchachitos estaban pequeños fue algo tremendo también verdad, cuando recuerdo, recuerdo es bastante doloroso porque no dejo de sentirme nerviosa cuando recuerdo todo lo que pase que me pareciera una pesadilla, una pesadilla. Cuando mi muchachito mayor tenia como, como 11 anos el llego un día de la escuela y me dice “mami firma este papel”, entonces le digo pero “espérate que lo debo leer”. Y lo voy leyendo y decía dice que lo tengo que firmar, porque mi hijo iba a pertenecer a la asociación de niños sandinistas, entonces yo le dije a él, “no eso si no lo voy a firmar” “si no lo firmas tu” me dice el, “va firmar el maestro”. Entonces era una situación bastante ya estaban como dicen lavando le el cerebro a mi hijo, como a muchos jóvenes les lavaron el cerebro de muchas formas. De muchas formas porque se cuenta se dice eso no lo vi verdad, pero si lo oí decir que en algunas escuelas a los niños les decían que oraran o rezaran y pidiéndole a dios caramelos. Entonces le pedían a dios caramelos, y no pasaba nada. Pero después le decían los piricuacos, esos que son del ejército, los sandinistas, bueno les decían a los niños. Dios les dio caramelos, no contestaban los niños. Bueno vuelvan a cerrar los ojos les decían a los niños, ahora pídanle a su presidente ósea al sandinismo, y entonces ellos les ponían dulces. Cuando abrían sus ojitos los niños miraban los dulces, y les decían bueno quien les dio caramelos? Dios o su presidente? Entices decían los niños que el presidente. Entonces ustedes tienen que ser leales le decían a los niños, a los sandinistas, a su presidente. Ósea fue como un lavado de cerebro a las pobres creaturas. Y por so me miraba en problemas porque yo no estaba de acuerdo. No estaba de acuerdo ni con uno con el otro, pero sin embargo todavía fue peor ahorita el sandinismo. También verdad, una de las cosas que me hizo venir para acá, fue de que se rumoraba que venia otra Guerra, que era la contra. Ósea la contra revolución. Porque muchos no estaban de acuerdo porque ellos habían traicionado las ideas que supuestamente ellos decían. Y a muchos muchachos se los llevaban. Es más yo a muchos muchachos que yo chineé, ósea que tuve en mis brazos, murieron. Allá murieron muchos jóvenes a causa de eso. Ósea que mas de alguno de mis hijos hubiera perecido. Por so fue una de las razones fueron tantas las razones de tantos problemas de que yo me decidí venirme con 6 de mis hijos. Solita con ellos. Uno de 13 anos, y el menor de 3. Y el terremoto que sucedió en Nicaragua, sucedió antes de la guerra durante o después? No, fue antes porque fue en el 1972 en diciembre. Y como fue que eso afectó la Guerra o la estancia, en Managua que fue mas afectado, y como se sintió durante el terremoto? Bueno durante el terremoto eso fue horrible porque fueron prácticamente dos. Uno y el siguiente fue a los 20 minutos que fue el que termino con todo Managua. O prácticamente con casi todo Managua. El terremoto afecto bastante mas que todo, como yo estaba bien joven todavía yo no salía. Estaban pequeñitos mis muchachitos, estaban mas chiquitos, pero si afecto bastante, pero sin embargo, si llegaron muchas ayudas de aquí de EEUU y las repartieron. Pero no le puedo decir mas de lo que paso con la guerra tal ves bueno lo tomaron tal ves como una ventaja no se. Y en las razones quien tenia la culpa o a quien culpaban? Bueno es mas ahorita que me estas diciendo eso me acuerdo que el primer diciembre que pase con los sandinistas fue algo espantoso porque ellos ganaron supuestamente en Julio y en diciembre no había ni siquiera sal. Tuve que andar en muchas pulperías y no encontré sal. Porque decían ellos, algo tan absurdo, de que los EEUU tenían la culpa. Como que los EEUU se había llevado el mar. Para mi bueno no se, era algo tan absurdo completamente. Se acuerda de otra cosa que paso durante la guerra? Si porque en plena Guerra llegaron unos guerrilleros y estaban como nerviosos, como diciéndonos que nosotros escondíamos algo. Entonces les hicimos pasar. Y ellos escultaron todo absolutamente todo. Y se quedaron tranquilos. Pero durante la guerra también, como a los diez días antes de terminar la Guerra, muchos guardias, cuatro guardias estaban custodiando la casa, y no porque nos estaban custodiando a nosotros, si no porque en días anteriores se habían metido unos guerrilleros en pleno combate. Entonces ellos decían que ellos iban a encontrar esa casa. Encontrar esa casa para matarlos a todos. Como que tenían la culpa. Y ellos sin saber estaban en el lugar correcto, porque éramos nosotros los que, a quien se les habían metido los guerrilleros a pleno combate. Eso fue espantoso, ósea nos miramos en problemas casi de muerte, por decir así. Tanto los guerrilleros, que son ahorita los sandinistas, como la guardia, que son los somocistas. Y cuando caían las bombas, o la balacera usted sentía como temblaba la tierra, o que sentía en ese momento? Bueno las bombas, las botaban en las calles y en las esquinas. Y caían montones de arena, y eso era espantoso como se oía el sin. Era una lluvia horrible se oía. También recuerdo que en la Guerra habían, tiraban muchas bombas, una ves que me acuerdo que yo iba a ver a mi papa, tenia que andar con una banderita blanca, todos teníamos que andar, allí no se miraban hombres. Solo las mujeres salíamos con una banderita blanca, y miro mucha gente que esta viendo al cielo, y que están viendo como estas bombardeando los demás barrios. Y eso fue espantoso, fue horrible por que bombardeaban a su propia gente. Eso fue espantoso, fue horrible. Muchos murieron con, o quedaban tal ves no muertos pero si con charnel ósea pedazos de hiero cosas así, de lo que tiraban las bombas. También en la guerra, en los 45 días de guerra que hubo, no había una pulpería donde se encontraba absolutamente nada, nada, nada. Porque si uno abría una pulpería, inmediatamente le prendían fuego. Y recuerdo que también a partir de que se metieron esos guerrilleros en mi casa, aunque no tenia que decir porque yo porque si no me moría también. Con todo y mi familia, dijeron la guardia que iban a quemar esa barrio porque estaba lleno de sandinistas, entonces a raíz de eso, mucha gente salió desesperada, como loca, y salió. Fue algo horrible porque quedamos unos cuantos nada más. Porque salía la gente y les decíamos ya viene la hora, ya viene la hora, la hora este de queda. Ósea, la hora 6 de la tarde, que nadie podía andar fuera. Ósea la hora que le llaman “toque de queda”. Y quien puso esa hora? La guardia pues porque para evitar esos ataques. Y aun así habían ataques. Porque en la noche recuerdo que por lo menos recuerdo que fueron dos o tres noches que pensé que nos íbamos a morir. Como nos silbaba, i como temblaba la tierra. Y yo tener que dormir en el piso con mis niños. Tenia en ese entonces, mi niño del que estaba embarazada cuando tomaron los barrios, tenia como seis meses de nacido nada más. Y por eso se decidió venir para acá? Por eso decidí venir me a este país, por que si no como les digo, mas de uno de mis hijos hubiera muerto, o hubiera sido mutilado. Porque conozco a unos que están completamente mutilados, ósea que les falta un brazo, o están desfigurados. Esa fue la decisión que me hizo venir para acá. Fue una decisión bastante difícil, bastante dura, porque tenía que salvar a mis hijos, pero dejaba allá a toda mi familia, a mi demás familia. A mis hermanos y a mi papa. Y cuando y como es que usted se vino a EE.UU.? Bueno yo me vine, nunca se me va a olvidar esa fecha, yo me vine en Junio del ano 1982. Me vine por Méjico, llegue hasta Méjico, porque ya había intentado sacar visa, a mi me la dieron pero a mis hijos no. Así que me vine hasta Méjico. De Méjico agarre un autobús para Tijuana, de Tijuana para San Diego. Una persona que nos pasara, nos paso por la loma. Se le llaman a esas personas Coyotes. De allí bueno, pasamos por San Diego antes de San Diego habían muchos retenes. Esa tarde fuego espantoso, pero gracias a dios, paso algo, un milagro, y nosotros pudimos pasar. De allí nos llevaron asta santana. En Santana nos entregaron allí, y nos fuimos hasta los Ángeles, y allí estuvimos por uno semana, y bien pasamos. Tuvimos que, no teníamos nada de ropa. Teníamos solamente lo que andábamos puesto. Pero gracias a dios estamos a salvo, de esa tiranía, de esa guerra, de esos problemas. De esa ansia de poder que tienen los Sandinistas allá en Nicaragua. Fue algo horrible porque allá tengo a mi familia también. Y como fue su travesía de Tijuana a EE.UU.? Vino por tierra o de Nicaragua como fue por tierra o por avión? De Managua a Méjico fue en avión, en avión. Pero de Méjico a Tijuana en bus. De allí también de Tijuana para san Diego fue en bus también, en carro. De allí también a santana de carro. De allí a los Ángeles en carro. Y de allí de los Ángeles estuvimos como una semana y nos venimos para San Francisco en avión. Y nunca hubo problema de que no podían sus hijos, de que no podían llegar todos? Siempre estuvieron juntos? O tuvo que dejar a uno de sus hijos atrás? Bueno cuando nosotros llegamos a Tijuana, fue un cuatro de Junio, llegaron por nosotros al día siguiente, y llevaron a tres de mis hijos. Y me quede solamente con tres, pero al siguiente, a la siguiente semana, entre semana, llego la misma señora por nosotros, pero había un pequeño problema, y ya ella no quiso volver. Y nos quedamos allí. Por eso es que se tuvo que pagar una persona que nos tuvo que pasar, un coyote. Porque ya se acobardo completamente ella. Pero yo pase solamente con tres de mis hijos, pero yo pase tan desesperada por que pasamos por la loma, corriendo mientras el helicóptero que guarda la frontera asía un recorrido por otro lada. Pero eso fue por segundos, entonces nosotros teníamos que correr, para pasar esa loma. Y nosotros tuvimos que tirar prácticamente como deslizándonos, dándonos vueltas. Eso fue horrible porque mi niño, el mas chiquito, el gritaba y gritaba toda la noche, paso gritando diciendo de que se quería ir a su casita desesperado. Fueron momentos bastante difíciles. Bastante difíciles porque aun cuando me acuerdo siento, aun que ya casi tengo 31 anos y medio de estar aquí, pero me siento como que lo vuelvo a revivir. Tanto como lo que viví allá en Nicaragua como cuando vine hasta acá. Y como se sintió cuando por fin llego hasta San Francisco, y que es lo hizo que se decidiera venir hasta la ciudad de San Francisco? Bueno yo me sentí muy feliz al haber ya estado con mis hijos aquí. Dije yo ya salve a mis hijos dije yo. Y la razón porque fui hasta San Francisco, fue porque me estaba esperando un familiar, y entonces por eso es que fuimos a San Francisco. Y se sintió aliviada al haber llegado aquí, un alivio, o como se sintió? Completamente que ya estaba libertada, ya esta presión de la guerra esa presión a pesar de que yo no tenia ni un papel, ni pequeño ni grande ni nada. Pero si me sentía que ya había salvado a mis hijos. Y como se siente en los EE.UU? Siente que su hogar esta aquí en los EE.UU. o en Nicaragua? Bueno es una pregunta que en realidad yo me siento repartida mi corazón esta bien agradecida con este país, primera mente con dios, pero también con este país, pero tengo a mi familia allá, gran parte de mi familia allá en Nicaragua. Ósea que me siento, que tengo dos hogares, tanto como aquí como allá en Nicaragua. Siente que en parte la guerra tuvo que ver con ese sentimiento del hogar? En el aspecto de que fue arrebatada de su hogar, en una forma u otra? Claro que si porque prácticamente aunque yo me siento tan feliz aquí me siento muy feliz muy agradecida, pero sin embargo me dolió mucho haber dejado a mi familia allá, mas que todo fue por la guerra. Por la situación tan horrible. Por salvar a mis hijo. Entonces prácticamente fue por la guerra, porque yo decía no, allá tenia mi casita, tenia mis cosas, tengo a mi familia. Así es que por eso y fue bien duro volver, prácticamente es como volver a comenzar. Fue bastante difícil. Porque ahora gracias a dios, ya tengo dos hijos nacidos aquí, nacieron aquí, yo ya soy ciudadana y por eso le doy gracias a dios. Pero no fue fácil toda esa trayectoria. Se dice fácil en unos minutos haber venido hasta aquí, pasar lo que pase pero me siento muy feliz porque aquí ya salve a mis hijos. No me caso de decir a mis hijos porque salve a mis hijos, a mis primero seis hijos que nacieron allá.